Charles Edward Duryea (1861-1938) was an inventor in Springfield, Massachusetts, who was best known for building the first ever gasoline powered automobile -the Duryea – in 1898. However, one of his lesser known inventions was his “Skycycle” – a human powered flying machine produced in 1893. 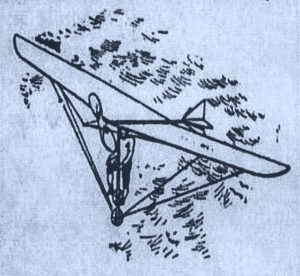 The Skycycle consisted of a framework with canvas wings that measured about thirty feet from tip to tip. A propeller mounted in the front was driven by a set of bicycle-type pedals operated by the pilot. Steering was accomplished via a rudder mounted aft of the pilot, which could be turned by a set of handlebars. It was reported that the machine was “extremely simple” and “not costly to build”. However, it is unknown if any of Duryea’s Skycycles were actually completed.